Avoid trauma to prevent white marks. It's one of those quirks that seems to affect almost everyone at some point or another: white spots on fingernails. Despite being so common, these curious marks remain something of an anomaly. In fact, there are many myths surrounding their existence. 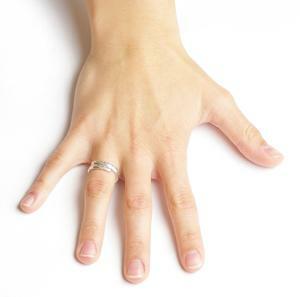 Small, white marks on the fingernails are often said to be indicative of a calcium deficiency. Other theories suggest a lack of another type of vitamin or nutrient, such as zinc. Despite the popularity of these claims, none of them have been proven true. White spots on fingernails are also known as leukonychia. This common condition can usually be attributed to something very simple: a basic injury to the base of the nail, also known as the matrix. Usually this injury has occurred at some point in the past, yet the white spot does not appear until six or seven weeks later. By then, the injury is long forgotten. This is simply because injuring the fingernail doesn't usually involve a traumatic event; often, it is something as basic as banging a finger on a door or countertop - in other words, a normal occurrence that doesn't warrant much attention. Occasionally, an allergic reaction to nail polish, nail hardener or polish remover can also cause white spots. The removal of acrylic nails may occasionally result in these spots, because significant (albeit painless) trauma can occur on the nail bed during acrylic application. If you enjoy frequent manicures (whether at home or in the salon), you may notice your fair share of white spots from time to time. This may occur if the nails are treated too aggressively, particularly when using orangewood sticks to loosen cuticles and remove excess skin. Avoid white spots simply by manicuring your nails slowly and patiently. Occasionally, white spots may be suggestive of a minor nail infection, but this is not often the case. Don't confuse minor injuries to the fingernail with much more serious ones. For example, simply knocking your nail on the car door may result in a white spot or two, but slamming your fingernail shut in that same door would cause some serious pain! You would also likely suffer black or dark blue spots as opposed to white ones. Use nail polish to cover them. Even a sheer peach or pink shade will do the trick and add just enough color to camouflage the spots. Moisture your hands regularly and take pains to massage the lotion into your fingernails. If your fingernails and the skin around them feel dry, massage them with vitamin E oil. If you notice an increase in white spots and can't pinpoint what is causing them, you may want to visit your dermatologist. As mentioned, white spots may sometimes be indicative of a minor infection. If this is the case, receiving treatment early will prevent any other nail problems from occurring. Though white spots alone are usually not indicative of underlying diseases, dramatic changes to the appearance of the nails may suggest that there is something serious going on elsewhere in the body. Nails that appear completely white, for example, may be indicative of liver disease, while extremely pale nails may suggest anemia. If you spot any abnormalities, don't hesitate to see your doctor. Regular nail maintenance can go a long way in preventing nail problems, both minor and major. Since white spots are usually caused by trauma to the nail bed, minimizing the opportunity for any sort of disturbance to the nail can help prevent them. Keep the fingernails trimmed regularly, since long nails are more susceptible to forceful injuries, and wear gloves in hazardous or chemical-heavy environments.